In 18th-century (and early 19th-century) England the word “prospect” was often used to mean “view,” and people enjoyed going out walking and hiking to find nice prospects. They would ascend high hills to enjoy the prospect; apparently, this is how one accessed the best view–oops, I mean prospect–of the university town of Oxford. Poets often waxed eloquent in praise of prospects (the well-known phrase “Distance lends enchantment” comes from one of these poems). 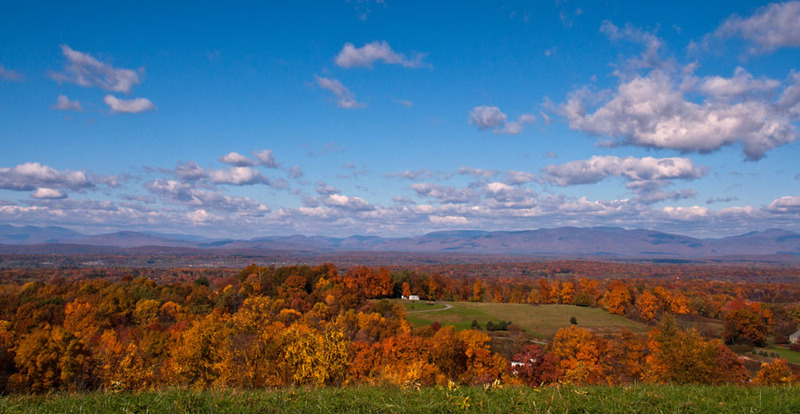 Those searching for an interesting “prospect” in the Hudson Valley might well consider a trip to Burger Hill Park near Rhinebeck. 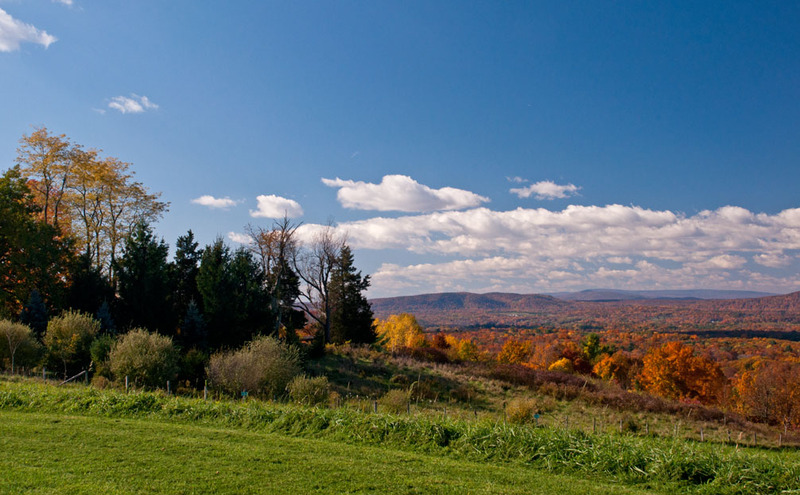 Burger Hill offers stunning views of the Hudson Valley and Catskills and of the surrounding, bucolic farmland, and is especially attractive during the foliage season, as you’ll see from my photos. I understand that it’s a great place for sledding during the winter, and during the spring and summer birdwatchers have plenty of opportunities for their favorite activity. In fact I noticed several nesting boxes built at various places and wondered what species they attract–possibly meadowlarks? Burger Hill has an interesting history. In the early 18th century a man named Burkhardt, a Palatine German who settled in this region, became a tenant farmer of Henry Beekman (maybe you’re familiar with the fine Beekman Arms restaurant in Rhinebeck), who acquired the land in 1679. Ownership eventually passed to the original tenant’s descendants, whose name over the years evolved to Burger. The property passed on to a series of different owners until it was sold to Scenic Hudson in 1997. 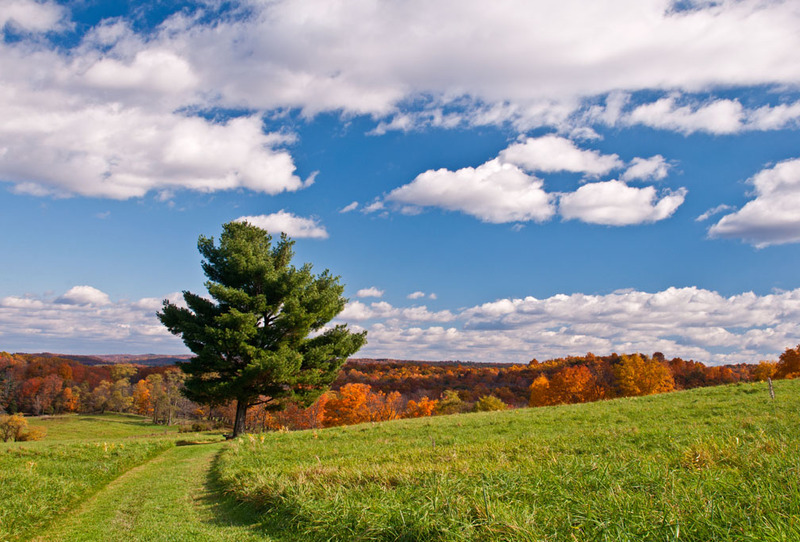 Currently it is managed by the Winnakee Land Trust. To enjoy the views you need to climb the 550-foot-high hill. There are three ways to do so, two gradual ascents (of which the one to the right is the more scenic) and one direct, unrelentingly steep path, which I don’t recommend unless you are quite certain you’re in the best of shape. You’ll find benches here and there and, at the top, stones into which are carved the shapes and names of the mountains visible on the opposite side of the river to help you identify them. Burger Hill is reached by driving south from Route 199. The turn-off, which is on the right, isn’t too far after the junction with Route 9G which leads into Rhinebeck. After you’ve scaled the hill and enjoyed the view, you might want to treat yourself to something at one of the nice cafes in town. These and other photos of the Hudson Valley, Catskills, and my other favorite places can be viewed and purchased on my website.